Are you really bored of usual chutneys,kurmas and sambars to serve along with your soft idlies or crispy dosas?? 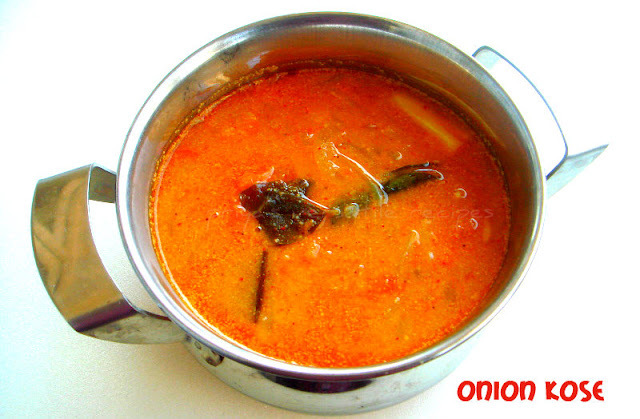 You should give a try to this super flavourful chettinad famous vengaya kose. Vengaya kose aka onion gravy is quite often prepared in every chettinad homes usually for breakfast to serve along with idlies or dosas. This simple but yet a delicious side dish goes for simple ingredients and gets ready very quickly. If you serve this side dish with idlies, am sure that you have to prepare more idlies than usual coz this vengaya kose will definitely pull everyone to eat more idlies. Grind the ingredients given under the list 'to grind' as fine paste with enough water and keep aside. Heat enough oil,fry the fennel seeds and cinnamon stick until they turns brown,add immediately the slit opened green chilly,curry leaves, fry for few more minutes. Add the sliced onions,chopped tomatoes, cook for few minutes until the onions and tomatoes gets cooked well. Now add the diced potatoes to the veggies and cook for few more minutes. Add the masala paste to the veggies,cook for few seconds. Finally add enough water, cook everything in medium flame until the gravy gets thicken. Serve hot with idlies or dosas. Recipe looks so simple... hope to try one of your dishes one day! Nice color and this is the first time I am hearing about this curry. Looks appetising. Maybe i should try this tomorrow with the Sunday morning dosa breakfast. We are having an overdose of coconut actually. This will be a welcome change. tempting, colorful and picture perfect..
Looks so yum Priya. Bookmarking this one. karasaaramaa oru naaoorum kose...wonder why the name is so. Very nice kose recipe dear. Love to have this with idly. Never heard about this curry, usual suspects fennel & poppy seeds to give the wonderful chettinad flavor. Will try.